I have a new story on Joyland and I hope you’ll read it. It’s a love story, and a story about dementia, and a story about moving back to Jerusalem from NYC, and a story about a few other things, but for me it’smostly an ode to the woman who was my grandmother's caretaker for many years, and an attempt to shed a light, small though it may be, on her reality (as she described it to me) and the reality of many migrant workers in Israel, whose difficulties have only gotten far worse--as they did in the US--since the early aughts, when this story takes place. 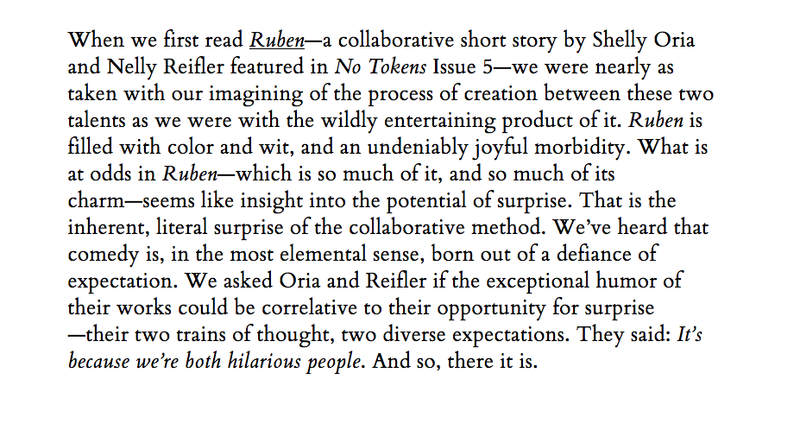 Nelly Reifler and I talked to the editors of No Tokens about our collaborative process, which began in their pages a couple years back. You can read the interview here. I have a new story at the Rumpus and I hope you’ll take the time to read it. I’m thrilled that my story “Beep” has been translated into Montenegrin by the incredible Dragana Kršenković Brković and published in the esteemed Balkan literary magazine ARS. A new story in Hebrew! I’m so moved to see my story “Mapuchiot” (Concertinas) published in the Israeli literary magazine Moznaim, which was established in 1928.